Venetia : Explanation Writing-Why people need to drink water? Explanation Writing-Why people need to drink water? - Use the' Title-Introduction-Information-Conclusion (TIIC) structure. Why do people need to drink water? 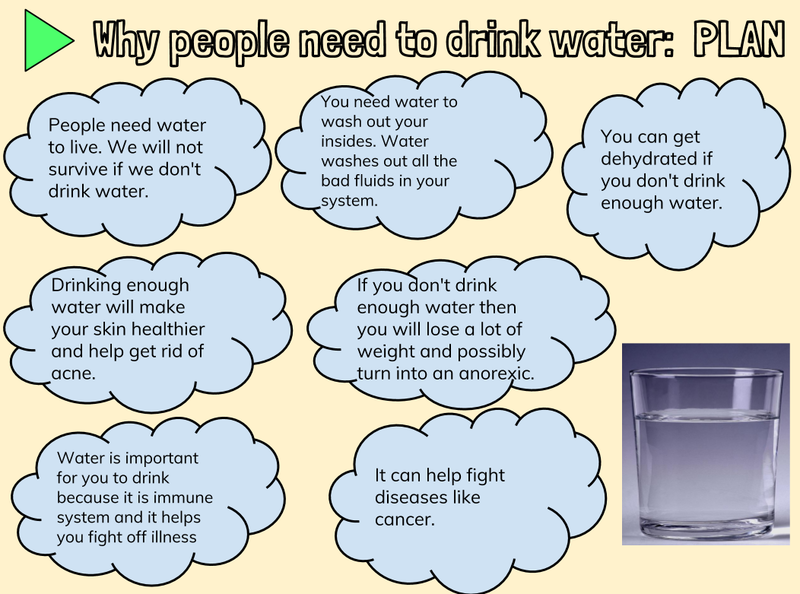 Today I am going to be informing you about why you need to drink water and why it is important. Water is one of the main things in the world that is needed. Water feeds everything living thing on the earth. It feeds the living animals, the nature and even us. Water is important to us because you need it to survive. If we don’t drink enough water we can die. Water can wash out all the bad fluids in your system so it can become healthy again. Water is important for us to drink because it is apart of our immune system and it can help fight of diseases. Drinking water can make your skin and body healthier and even help take your acne away. Water is so important to us. It can make us less cranky, have no headaches, help you lose weight and even help you have no joint pain. Water is very important because it helps your kidneys function properly and helps energize your muscles.